Standalone software modules developed in Flash / .Net / Java. The customers’ needs can often be met with affordable and available software based on common standards, combined with assistance in establishing correct and effective workflow – and a certain amount of customization for an optimal solution. Where our capacity or competence does not suffice, we will draw on cooperation with other development companies. One of our partners is Knowlex. Knowlex has specialized in developing database interfacing, connecting with other server based functionality and communication solutions like SOAP and REST services, and plug-ins for desktop applications. Knowlex has done work for several of the larger players in the publishing and media marketplace. They do both Apple (iOS, OS X) and Microsoft (Windows) application development and have long experience with project management. For details about Knowlex’ skills visit Knowlex to find out more. For The Norwegian Forest and Landscape Institute, in a project called “Tilbakeblikk” (norwegian for “looking back”), we developed a web flash module for showing the changing of landscapes in Norway over time. Every location has been photographed from the same standpoint twice, and many old photographs have been recaptured to show changes. 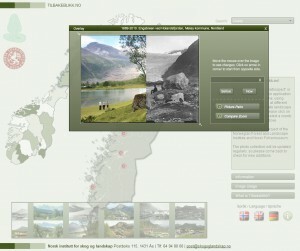 The project aims to illustrate and create awareness about landscape changes in Norway. The flash module includes an interactive map showing the location of the photographed landscapes, functionality for comparing the images of the changing landscapes and pdf download of fact sheets. The module supports multiple languages. Image files and PDF documents are managed in the background by an image archive.